sycamore stirrings: 6 Years Old! 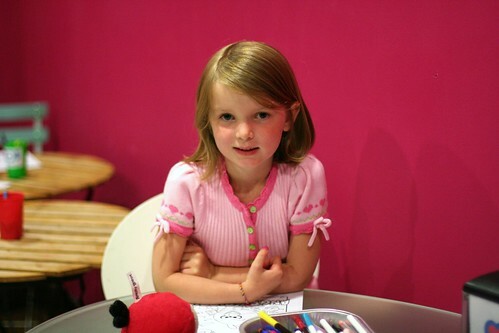 In late July we celebrated my sweet Audrey's sixth birthday. 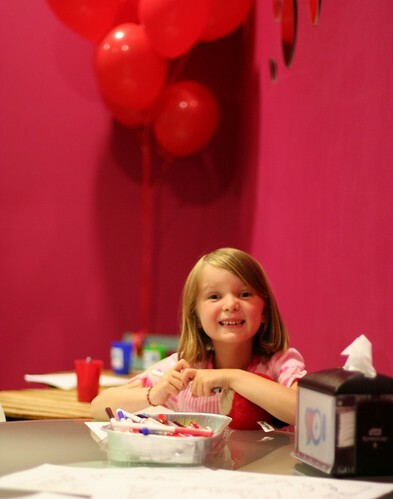 We held her party at a local Frozen Yogurt shop, invited a few friends and set about the happy business of celebrating her. We decided that since Eva had a special cake on her 6th birthday Audrey would have one too (although, really, they are all special.) 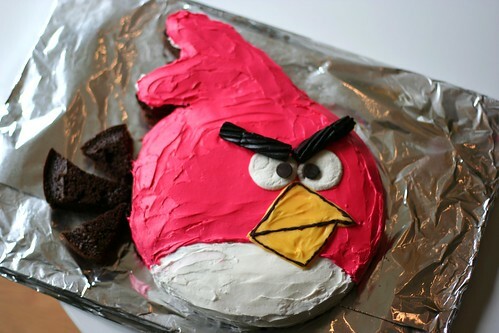 She went back and forth about what kind of cake to have but kept coming back to one - an Angry Bird cake! Naturally I wished she'd picked something less commercial (mermaids, cats, candy, pony) but this is what she really wanted. Strange as she'd only played the game a few times but for some reason these angry little birds captivated her. 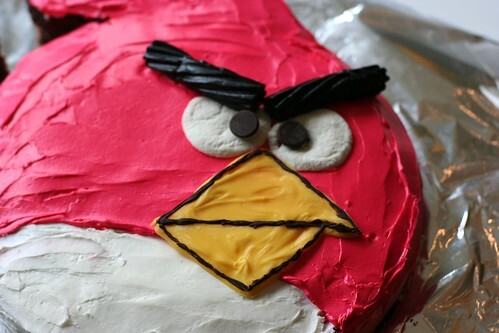 So, an Angry Bird cake it was. I really enjoyed planning and making the cake (see notes below). 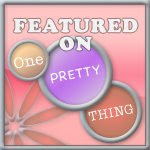 The girls loved it too and were very proud of my endeavor. It was sweet. 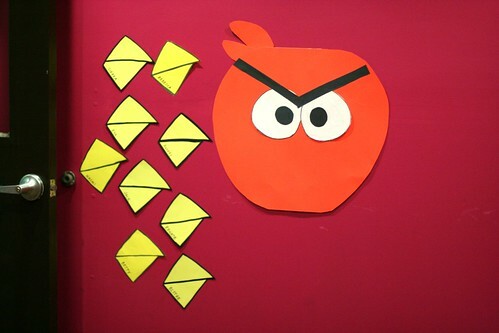 We played a little Pin the Beak on the Angry bird as well as some Angry Bird Bingo. I also had some Angry Bird coloring sheets for the kids to work on while the guests arrived. 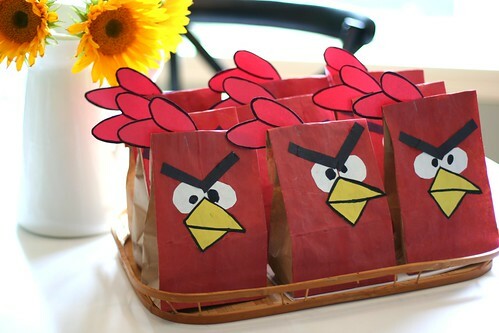 The girls made Angry Bird goodie bags. We put a pen and 2 packs of fruit snacks in each. The kids seemed to enjoy themselves and Audrey felt very celebrated. An Angry Bird party for a very happy girl. Who is now 6!?! Gah! Cake Notes: To make the cake I made two 8-9 inch circular cakes. Used one for the bird and cut the head feathers and tail feathers out of the other. The eyes are sliced jumbo marshmallows that I then rolled flat with a rolling pin. Pupils are chocolate chips. Eyebrows are black licorice. The beak is made of yellow candy melts which I formed on wax paper (template underneath the wax paper) and then "outlined" with melted chocolate chips and a toothpick. The tail feathers are unfrosted pieces of cake. 6! love that sweet girl! Growing up so fast! I knew her when she was in the womb! Excellent idea on the yoghurt shop. Happy Birthday to your sweet girl. I know exactly what you mean about wishing she would have chosen something else ... nice job with the cake and party favors.